So where did this all start - As long as I can remember I have been interested in aircraft and almost as long in electronics (and believe me that is a long time). I could never justify the cost of getting and maintaining a private pilots license, so as I have owned a PC, in one form or another, since the late 1970s, I decided to give flight simulation a go. 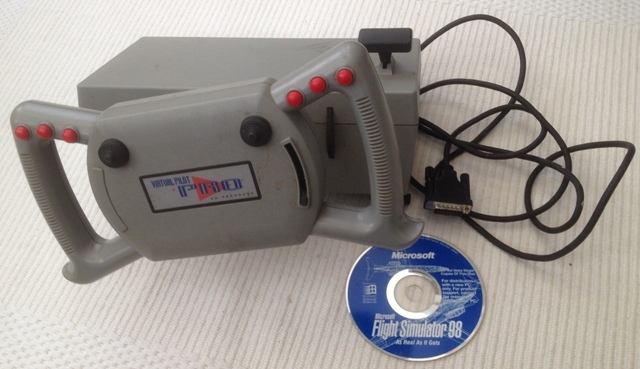 I started with Microsoft Flight Simulator 98 and a CH Products yoke. Although this was okay, it did not provide the immersion effect to make you think you were actually in the aircraft. In 2005 I read an article in a PC magazine about hardware you could interface to your PC that simulated the actual instruments in the cockpit. This was the start point for a project that is still not finished after almost ten years. I decided to make the simulator as 'real world' as I could and modelled it on the Cessna C172. 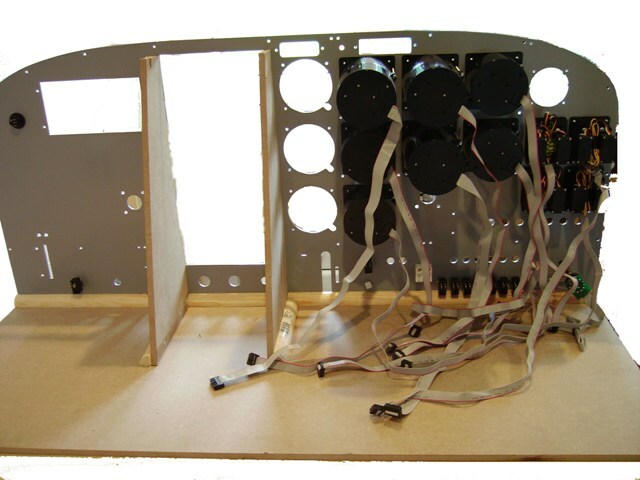 The starting point was the products available from Simkits, the original plan being to purchase three or four gauges and make some kind of panel from MDF to mount them. The reason for choosing Simkits was that little else was available in Europe at that time. After constructing the Altimeter, Air Speed, Tachometer and Fuel gauges, I decided to puchase the TRC472 painted panel from Simkits and then add guages as and when funds permitted. The Simkits front panel was attached to an MDF base and braced around the radio stack position with two MDF sections. These MDF braces were later replaced with aluminium strip sections. The whole structure was supported on a stand constructed from box section steel, making the simulator movable by two people. In 2007 I went off at a bit of a tangent and started building a hardware simulation of the Garmin GNS530 GPS using the software from RealityXP. This then expanded to building the complete Radio Stack using interface electronics from OpenCockpits. By November 2009, I had completed the GNS530, a KMA26 Audio Panel, two KX155 Transceivers, a KN62A DME and a KT76C Transponder. 7 segment LED display unit. I decided that one possible way to achieve a realistic representation of the display would be to use a 2 line by 24 character LCD display. Unfortunately the OpenCockpits LCD display interface can only display, as variables, numeric characters and thus another interface solution was needed. The solution to the KAP140 problem was to design a new interface around a dedicated microprocessor based controller and to write the controlling software from scratch. This became the starting point for the second version of the simulator. The development of the second version of the flight simulator progressed through two distinct phases. The first phase involved replacing the OpenCockpits modules with interfaces built around micro-controller based devlopment boards. There are a number of relatively inexpensive development boards, e.g. the Arduino range and those boards based around the PIC microprocessor. 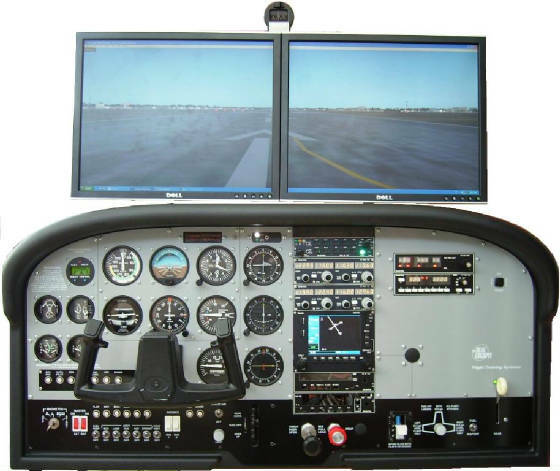 It was decided to used a UBW32, which is a 32bit PIC board for the Autopilot as this board has sufficient built-in inputs and outputs for the combined Autopiliot and ADF unit. Other PIC based solutions were used for the other interfaces, so as to maintain a consistent approach. The PC side software was developed using Microsoft Visual C#. The second phased of the development was undertaken as a result of swapping from Microsoft Flight Simulator FSX to Lockheed Martin Prepar3D Ver 2.x. This change was made inorder to exploit newer graphics card technology and to ensure that the simulator was based around a software platform that was still being supported and further developed. The chanage to Prepar3D resulted in a change to the Radio Stack. Originally the GPS was based around the RealityXP GNS530 WAS software, although this unit worked execpionally well, it was not compatible with Prepar3D. 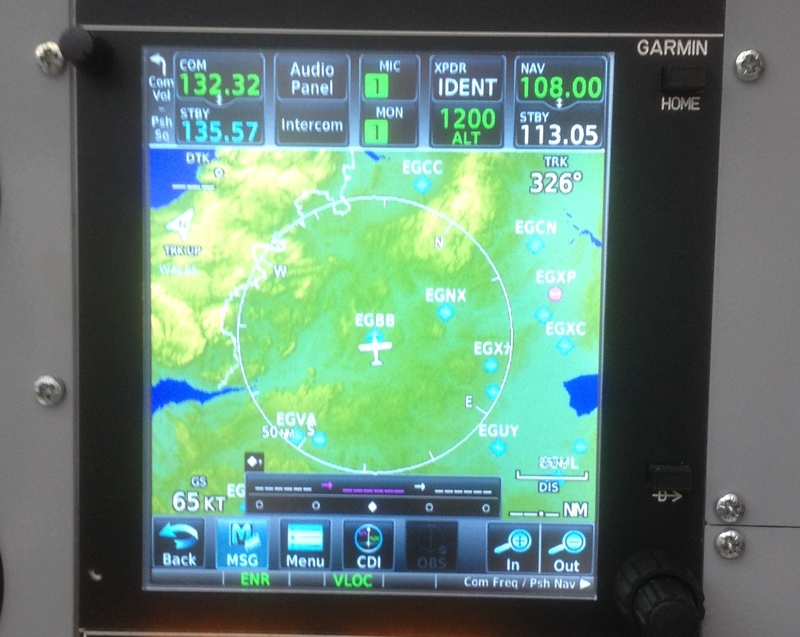 After experimenting with another GNS530 software application from Mindstar, a new touch screen GPS was developed around the GTN750 software, available from Flight1. 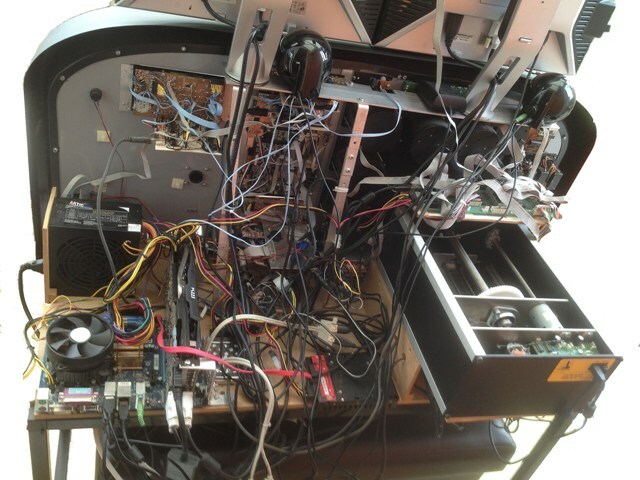 Further changes were made to the Radio Stack inorder to make sufficient space available for the GTN750. Tha Simkits manual elevator trim control was modified by adding a stepper motor, magnetic rotary encoder and a micro-controller, so that it could be used as an automatic device, coupled to theAutoPilot. The PC side Microsoft Visual C# code was developed separately for each module in the Radio Stack, i.e. 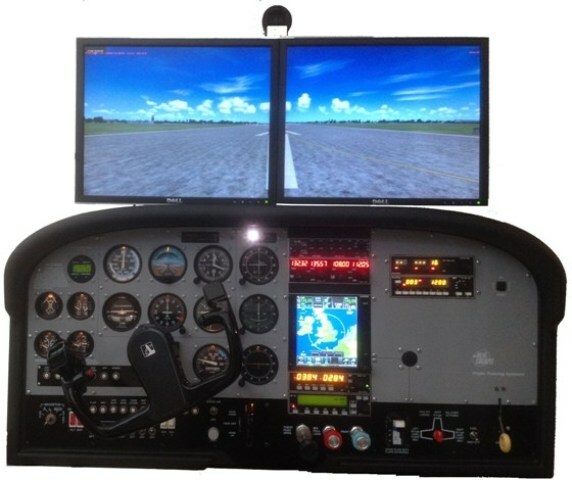 ADF/AutoPilot, Audio Panel, Transceiver, DME/Transponder and Automatic Trim Control. As the Radio Stack components were considered to be reaching their final form, the individual C# applications were combined in to a single software package. 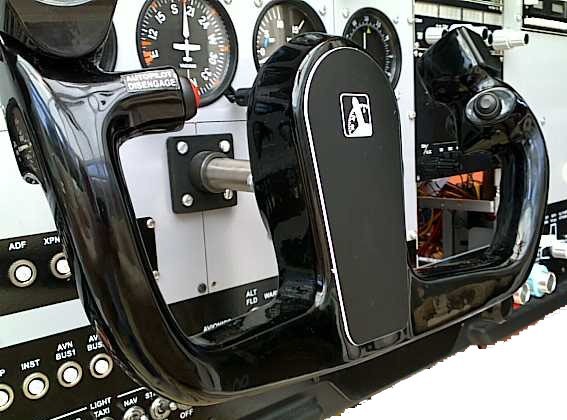 Version2 of the simulator also included a force feedback yoke as a replacement for the original spring based unit. The one thing missing at the present is a set of rudder pedals. I am currently looking at what's available commercially, rather than building something. I would like to do the visuals better, but am restricted by space, so perhaps larger screens rather than projectors. A motion platform would be great, but as the simulator resides in our conservatory, I do not think the whirring of large electric motors or the hiss of hydraulic rams would be acceptable to my wife. An actual cockpit enclose also sounds good, but where would I put it.